Another splendid Royal Ascot week is almost at an end with the Diamond Jubilee Stakes as the blue riband event of the closing Saturday. Over 300,000 people will have descended on the Ascot Racecourse over the five day event, but if you can't be one of them then we'll tell you how to watch a free Royal Ascot live stream instead. 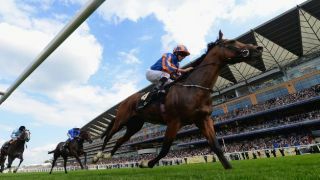 This year the Royal Ascot week, at the Ascot Racecourse in – you guessed it – Ascot (about 30 miles West of London), runs from Tuesday June 14 to Saturday June 23. Races start from from 2.30pm BST every day of the event (so 9.30am ET, 6.30am, 11.30pm AEST) with the last race of each day at 5.35pm BST. The event was founded by Queen Anne way back in 1711 and it's still going strong. While the week is now as much about dressing up, enjoying food, drink and hopefully good weather – it's also, of course, about the horse racing. Plenty of world famous trainers, owners and celebs will be at the event, but it's the horses that are the true stars. In today's Diamond Jubilee Stakes, super sprinter Harry Angel will want to overturn a 0-4 record at Ascot. He’ll face competition from Australian raider Redkirk Warrior. If you want to catch all the action live, read on to find out the best way you can do exactly that from wherever you are. And the best bit? It's absolutely FREE! Coverage of the event will start at 1.30PM BST daily and run across the five days. If you're outside the UK and want to keep up with your wagers and accas with Ed Chamberlin and the ITV racing team, then you can always use a VPN as described below to tune in without being blocked. Simply open the VPN app, hit 'choose location' and select the appropriate location - it's super easy to do. Choose UK to stream Royal Ascot 2018 live for free (use the links below). The TVPlayer service is free and the best legal way to stream all of the action at this year's Royal Ascot 2018 live. Once your VPN is up and running with a UK location, simply head to TVPlayer.com. In the US, NBC Sports will be showing live coverage of the Royal Ascot 2018 week from 8.30am ET / 5.30am PT every morning (9am / 6am on Saturday). You'll need an NBC cable subscription to get access. But our clever little VPN workaround above works equally effectively if you're in the US. That means you can catch the racing without having to pay a cent for it. Where can I watch Royal Ascot 2018 using a VPN? A VPN will enable you to watch Royal Ascot 2018 from literally anywhere. So that obviously includes: the United States, France, Russia, Spain, Japan, Italy, Poland, Germany, Mexico, New Zealand, Czech Republic, Ireland, Austria, Thailand, Canada, Australia, Denmark, China, South Africa, Argentina, Singapore, Turkey and more!